Joe Wurzelbacher found celebrity under the moniker of 'Joe The Plumber' after publicly challenging Obama's tax plans during the Presidential campaign. 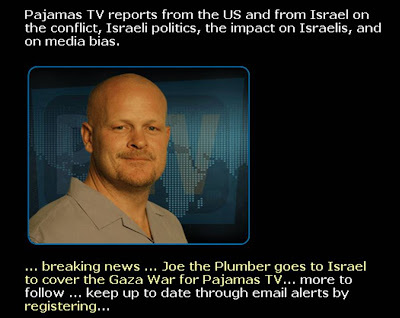 However, not content with his 15 minutes of fame, Joe The Plumber has volunteered to participate in a PyjamasTV (pjtv.com) scheme to send a Citizen Reporter to the Middle East to cover the current Gaza conflict. Joe has said he will spend 10 days covering the fighting in order to explain why Israeli forces are attacking Hamas. Joe says that "being a Christian, I'm pretty well protected by God I believe." "That's not saying he's going to stop a mortar for me, but you gotta take the chance." Will be interesting to see the results of sending an 'ordinary citizen' abroad to be a war correspondent! At the same time Das Bild in Germany have launched a scheme that could take Citizen Journalism to another level. Germany's biggest selling newspaper, Das Bild, is selling cameras to its readers through a partnership with German supermarket Lidl. The cameras have an inbuilt 2GB memory, cost €69.99, can take pictures and video. They also have a USB port which allows for direct uploading to Das Bild, where editors can review the efforts and consider them for publication. "uMakeTheNews.com brings blogging, forums, and online discussion together to create a modern replacement of the newspaper. The website merges the largely disconnected blog networks into organized, threaded, discussion forums; creating a communications media outlet on the Internet." 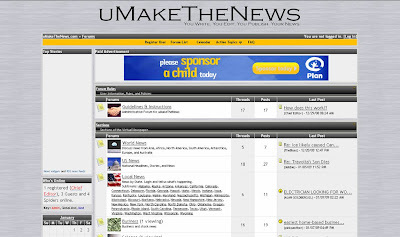 UMakeTheNews.com seeks to combine the principles of blog aggregation and forums in one site. On the one hand this takes the conversation away from individual blogs and centralises discussions, on the other hand it gives individual content creators a platform where they can potentially reach a much wider audience. As social media develops and 'citizens' produce ever more content, traditional news organisations are being forced to re-evaluate their way of producing news. It is interesting that the German Journalists association is not enamoured by Das Bild's initiative whilst less surprising that eyebrows have been raised about Joe The Plumber's 'Gaza adventure.' Regardless of the good points and bad points of the above, it is more evidence of how consumer generated content is helping to reshape news output. Citizen criticism - rise of the celebrity commenters!